John H. Durham, United States Attorney for the District of Connecticut, Patricia M. Ferrick, Special Agent in Charge of the Federal Bureau of Investigation, and Hartford Police Chief David Rosado today announced that an investigation into the gang-related trafficking of fentanyl, heroin, cocaine and crack cocaine and associated violence in Hartford’s South End has resulted in federal charges against 13 alleged members and associates of the Almighty Latin Kings Nation (“Latin Kings”). Jeffrey Ferry also is charged with possession of a firearm by a previously convicted felon. These defendants, with the exception of Santos and Cortes who are in state custody, were arrested today. They appeared before U.S. Magistrate Robert A. Richardson in Hartford and are detained. Two individuals are being sought by law enforcement. 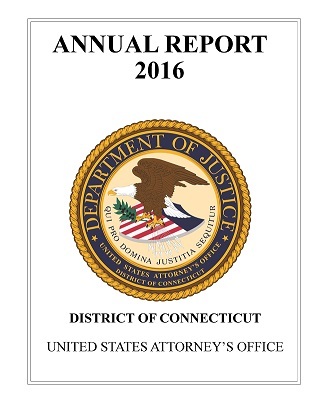 As alleged in the criminal complaint, this matter stems from a joint law enforcement investigation headed by the Federal Bureau of Investigation’s Northern Connecticut Violent Crimes Task Force and the Hartford Police Department’s Vice and Narcotics Division targeting gang violence and narcotics trafficking in Hartford. The investigation, which has included court-authorized wiretaps, physical surveillance and controlled purchases of narcotics, revealed that that Jimmy Flores, also known as “Cuz-o,” and Nelson Ferry, also known as “300,” operated separate drug trafficking organizations comprising members of the Latin Kings in Hartford’s South End. Both drug trafficking organizations distributed fentanyl, heroin, cocaine, and crack cocaine, and use multiple locations to process, package, store and distribute narcotics. Both organizations also possessed firearms in furtherance of their drug trafficking activities. The complaint further alleges that the Nelson Ferry drug trafficking organization operated a “trap house” at 149 Wethersfield Avenue in Hartford as a distribution point for drug customers. On May 22, 2018, Julian Bravo was shot and seriously wounded in an apparent robbery of that location. The complaint alleges that, on June 3, 2018, Jeffrey Ferry, also known as “30,” and Yasil Santos, also known as “Lilo,” were arrested on state charges after intercepted communications revealed that Jeffrey Ferry had a gun and planned to meet someone to settle a dispute. Hartford Police officers stopped a car Ferry was driving and located a loaded 9mm pistol in the car’s glove box. Santos was in the car’s passenger seat. In association with today’s arrests, investigators executed federal search warrants at two locations in Hartford and three locations in East Hartford and seized approximately 150 grams of fentanyl, approximately 20 grams of crack cocaine, other narcotics, and two firearms. U.S. Attorney Durham stressed that a complaint is only a charge and is not evidence of guilt. Charges are only allegations, and each defendant is presumed innocent unless and until proven guilty beyond a reasonable doubt.